The 2019 Annual Meeting Call for Papers portal is open throughout the year for a variety of session types and for a variety of submission periods. Below are the various submission periods for the Annual Meeting Call for Papers. Click on the submission periods to view greater detail about the proposal submission types within each. Below are the proposal submission types available for the Annual Meeting program. They are not available during every submission period, so please review the "Submission Periods" above to see which submission options are available throughout the year. >> Special Events are business meetings, committee and board meetings, or food and beverage functions (breakfasts, lunches, receptions, etc.). Proposals submitted within this designated session type will be scheduled as part of the special events program and are the responsibility of the executive office. To avoid conflicts with scholarly sessions, most special events are limited to 1.25 hours. Priority in the assignment of time and space will be given to AAA and Section business, board and committee meetings. Other special events will be accommodated to the degree possible. For events sponsored by organizations other than AAA Sections, there is an administrative fee of $500 to cover costs of arrangements and inclusion in the program. The Special Events Program will not accommodate panels, papers or professional presentations that belong on the scientific program. To be listed in the meeting program, special event proposals must be accompanied by administrative fees at the time of submission. other special events (such as collegiate departments of anthropology hosting alumni/networking events). Eligibility: All Annual Meeting participants must be paid Annual Meeting registrants (by April 10 at 3 pm ET) AND have active memberships through November 24. 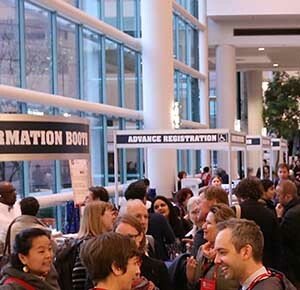 Anthropologists outside of the U.S. or Canada, or non-anthropologists, may request a Membership Exemption, but meeting registration is still required. Membership exemptions must be requested by Wednesday, March 20. For financial assistance with registration, please complete the Program Chair Waiver application prior to Wednesday, March 20. The completion of an application does not guarantee a waiver will be awarded. Financial Assistance: For financial assistance with registration, please complete the Program Chair Waiver application prior to Wednesday, March 20. The completion of an application does not guarantee a waiver will be awarded. Ability to present as a nonmember: Anthropologists outside of the U.S. or Canada, or non-anthropologists, may request a Membership Exemption, but meeting registration is still required. Membership exemptions must be requested by Wednesday, March 20. Elimination of double sessions: The task force discontinued double sessions in 2014 to standardize the time unit for panels and address scheduling burdens. However, organizers can submit a series of single sessions (i.e. Part I, Part II) that will be individually reviewed and ranked by its merit. Part II may be accepted while Part I may not. The Executive Program Committee (EPC) will make every effort to ensure that accepted in part series are scheduled in proper order, but can't make guarantees. AAA CFP online submission portal: As with the 2017 and 2018 Annual Meeting Call for Papers, AAA is continuing to use an online portal powered by our vendor, CadmiumCD. All sessions and items for consideration of inclusion in the 2019 AAA/CASCA Annual Meeting program MUST be submitted through this online portal -- no exceptions. For technical assistance, please use the technical assistance tab in the online portal, or contact AAA at AAAmeetings@americananthro.org. Submission deadlines and time stamps: It is very important that submitters pay attention to all dates and time stamps outlined on this page and throughout the online submission portal. If a time stamp is listed, such as 3 pm ET, that is a hard deadline and the online portal will not allow any entries after that time. AAA staff are here to help and are happy to assist within our designated office hours of Monday through Friday between the hours of 9 am and 5 pm ET. AAA appreciates your patience and understanding!